Push Drive™ Technology delivers increased efficiency, longer run time and lower noise for drywall fastening . With Push Drive™ the motor starts only when the fastener is engaged with the work piece, so battery power is used more efficiently for significantly longer run time. Contractors benefit from less downtime charging batteries, and from a quieter work environment since the motor runs only during fastening. The Makita 18V LXT® Lithium-Ion Cordless 2-Piece Combo Kit breaks new ground for drywall contractors. 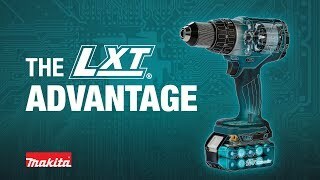 The XT255R includes the 18V LXT® Brushless Drywall Screwdriver featuring the exclusive Push Drive™ Technology. With Push Drive™, the Screwdriver can be set in lock-on mode and the motor will start only when the fastener is engaged. This gives contractors a quieter work environment, and also saves battery power for longer run time. The combo kit includes the 18V LXT® Cut-Out Tool with a slim-body design and 30,000 RPM for fast cutting. The 18V LXT® Compact 2.0Ah battery reaches a full charge in only 25 minutes for less downtime and increased productivity. For added convenience, the batteries feature an on-board L.E.D. charge level indicator. Shipping Weight : 13 lbs.